For parents who need talk to their kids about a traumatic event, I thought the information from the Day Middle School Principal Brian Turner was really helpful. Please visit these websites for information about how to appropriately respond and effectively communicate with children after traumatic events and news. This information is suitable for educators and parents alike. The National Association of School Psychologists provides tips for parents and teachers at this website. The Substance Abuse and Mental Health Services Administration also provides guidance on how adults can help children after a traumatic event at this website. Dr. Robert Evans, Psychologist and School Consultant, offers five guidelines that can make a positive difference for children after tragic events. Visit this link for more information. Take care of yourself and give yourself some time to come to terms with the event so that you are more able to reassure children. Understand that each child will handle an event like this differently. Some middle-school-aged children will talk openly about it, others may act out in unexpected ways, and some may not seem impacted at all. Maintain routines to establish a sense of normalcy for children. Minimize or avoid projecting your own reactions onto children. Instead, openly observe and listen to their reactions and respond to their level of engagement and need. Often times, adults’ reactions are much stronger and deeper than children’s, and we should be careful not to inadvertently subject children to our own complex responses and levels of understanding. Know that children are resilient and often rebound much faster than adults, especially when given opportunities to ask questions and be heard. Answer questions children may have as best you can and show them you care. Strongly consider limiting your child’s exposure to media sources that are covering this event. 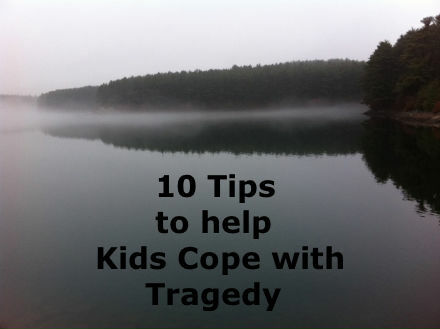 Also 10 Tips on Supporting Your Child through Crisis.